We were staying at a friend’s cozy house in the woods, and we slept downstairs in her semi-basement apartment. Thus, the windows were at eye level for us inside and at ground level outside. The first morning, at about six o’clock, I woke up to a strange double tapping sound that seemed to come from different parts of the apartment. Intrigued, I got up and wandered out to the kitchen to see if the refrigerator or the heater was making the noise. Puzzled, I suddenly heard the sound coming from the family room. 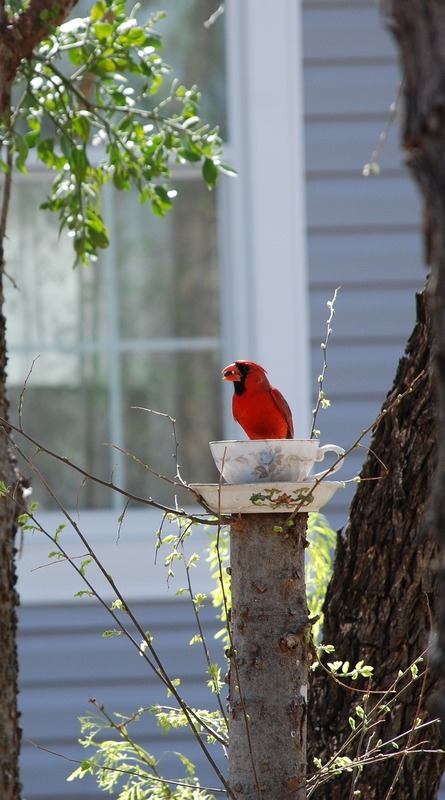 I walked in quietly, and to my amazement, I saw a brilliant red bird outside, a cardinal, attacking the windowpanes! It flitted from window to window around the house—the bedroom, the bathroom, the TV room—wherever there was a ground-level window. As I quietly drew closer to the window, I found a clue to the mystery—a female cardinal outside, just a few inches away, contentedly pecking at seeds. But why was the male attacking the windows? Apparently, it kept mistaking its own reflection for a rival cardinal and was trying to scare it away! It was fooled by appearances. I later confirmed that this was the motive for the bird’s strange conduct. We found that out, early each morning. What can be done to stop this compulsive male conduct? “Sometimes it becomes necessary to cover shiny surfaces to restore peace and quiet . . . , to say nothing of trying to keep the bird from harming itself in these near-suicidal attacks."